Not a big fan of Halloween. Today was a trick instead of treat. The weather is still good out here in Colorado, so I thought I would try to get a few more days on my mountain bike before the weather changes completely. 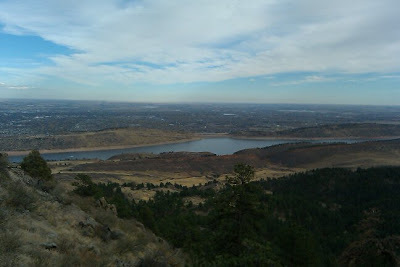 Lory State Park has many fun trails that climb forever and have flowing and technical single track all the way down. I decided to do The Big Loop at Lory today. It is a beast of a trail that climbs more than 1,300 ft. to the summit of Arthur's Rock and descends back down to the valley trails. At over 12 miles and a 2+ hour ride, it is a great test of endurance and skill. It is also a beautiful ride the spans the length of Arthur's Rock ridge. The ride starts in the valley and climbs up from the North to the backside of Arthur's Rock. The climb is brutal, but fun all the same. The technical rock sections are very hard, but a good test for any rider, and the down on the other side is fast and technical. My ride went great and I summited behind Arthur's Rock in good time. I had a quick snack and got ready for the descent. I was flying down the Howard Trail back toward the parking lot when a strange sound caught my ear and I stopped. I looked down at my rear tire and knew immediately that I would be walking the rest of the way back (2+ miles). A small rubber bubble was poking out the sidewall of my tire! Apparently it had taken a gash earlier in the ride and the inner tube was pushing itself out the opening in the tire. I knew it was only a matter of time until it popped and I didn't have anything to patch the actual tire. I kept riding, wincing every time I went over any obstacle. Five minutes after stopping the tube blew and i hiked my bike the rest of the way down the mountain. I had walked the rest of the trail to the valley, but still had 1.5 miles back to the entrance of the park where I had parked. As I walked into the valley parking lot a man and woman were packing up after riding. "How's it going?" I said. "Better than you it looks." He said. We laughed. I told him what had happened and asked if I could get a ride back to my car. He was happy to help me out. We threw all the bikes into their truck, drove back to my car and they dropped me off. Despite the blown tire the riding was fun and the weather held out until I got back to my car. Arthur's Rock with Fort Collins below.